Briley is proud to introduce its new Black Cloud choke specifically engineered to bring out the best performance that Federal's Black Cloud ammo can deliver. By providing internal choke geometry and dimensions specially suited to compliment the Flight Control wad, Briley is able to produce unmatched pattern quality and uniformity. You'll find this combination produces extremely tight patterns down range to deliver the most consistent kills in the field. 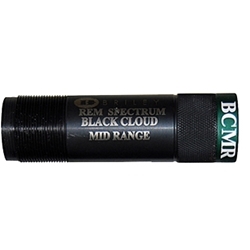 Black Cloud Midrange chokes have a .020" constriction. Midrange is best utilized in the 30 to 45 yard area. Briley is also currently in the developmental stages of producing chokes to produce optimum performance with Federal's Turkey loads and Buckshot ammo that also utilize the legendary Flight Control wad. Look for those in the near future.